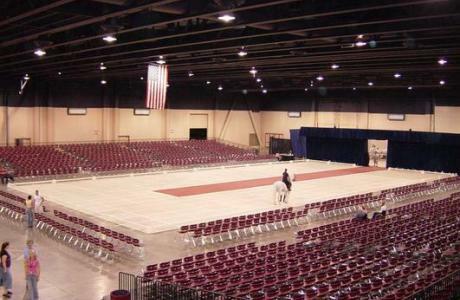 The Dixie Center St. George, Utah opened in 1998 and added 22,000 square feet in 2006 to total 32,000 s.f. 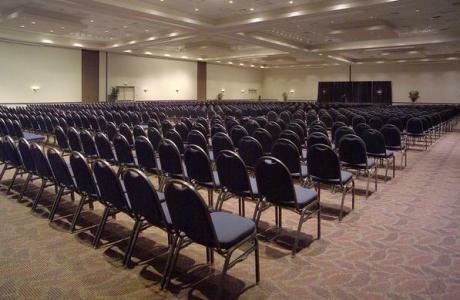 of meeting space and a 46,500 s.f. column-free exhibit space. This full service Utah conference and event venue is next to a hotel and can be flown to directly via Delta or United or a flight to Vegas is just 120 miles away. 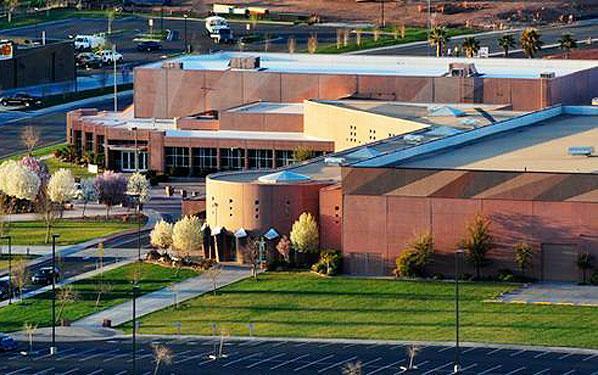 View below for more information on what makes the Dixie Center at St. George an ideal conference or event venue in St. George, Utah. Center open year round to accommodate all Utah meeting and event needs. T-1 internet access, teleconferencing, videoconferencing capabilities. All A/V needs and special requirements can be met. 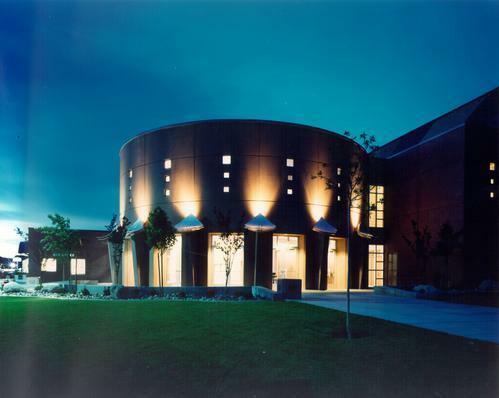 Center provides full catering and concession services. 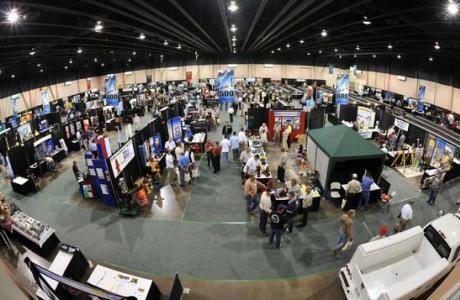 Can serve up to 4,000 in exhibit hall with white glove service! Will work with group to determine event needs. Summer discounts available July & August. 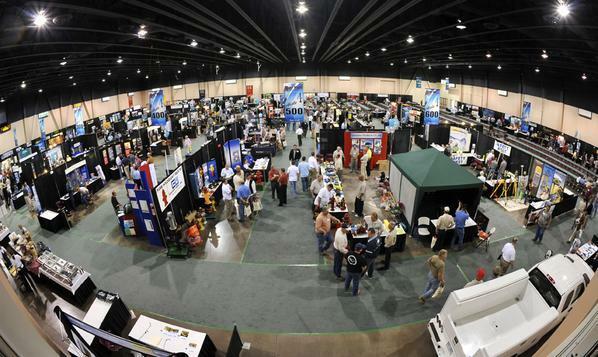 Exhibit Hall	 The Exhibit Hall features column free exhibit space for trade shows, large meetings, banquets,and special events. 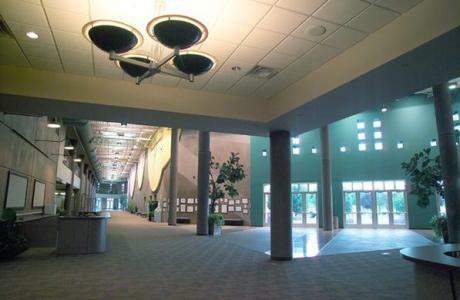 Can be divided into (2) 22,500 sq ft halls. Ballroom	 Verstile meeting space for a banquet or general session. Can be divided to create six smaller meeting rooms for breakout sessions. Garden Room	 The glass enclosed Garden Room situated in our North Lobby offers elegant reception/banquet or meetng room space while maintaining the outdoor/indoor feel the Dixie Center is famous for. Entrada	 Three mid-sized rooms combine for a variety of configurations or open to accommodate a large range of activities. Sunbrook	 Three mid-sized rooms combine for a variety of configurations or open to accommodate a large range of activities. 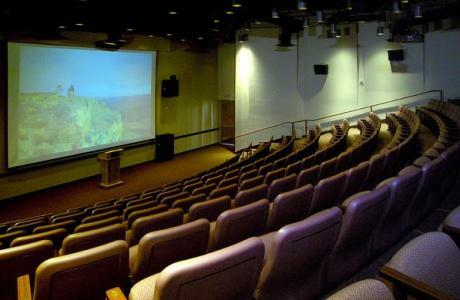 Auditorium	 The auditorium features 178 stadium fixed seating with state of art audio visual. Green Spring Board Room	 Our mid-size board room seats 20 with fixed conference style seating with oversized conference chairs. Red Hills Board Room	 The smallest of the two board rooms seating 10 at round fixed table with oversized conference chairs. Mezzanine Level Suites	 Five mini-suites overlooking the exhibit hall are great hospitality suites or smaller meeting rooms. Suites divide for a total of nine small suites. North Lobby	 The spacious lobby and pre-function areas offer just the right spot for networking/breaks, table top vendors and receptions. Main Lobby/Grand Concourse	 Great location for additional vendors, networking, displays, etc. Begin your conference with a Breakfast Buffet or a served breakfast. You will not be disapointed with the quality or quantity. Choose from a variety of Themed Breaks, pick and choose from the ala carte menu or just add treats and snacks to fit your event. Don't forget the chocolate fountains. From salads to box lunches or a full buffet to served meals, options are endless. Begin your banquet with a selection of Hors d' Oeurves, or pick and choose for weddings, socials or any event where a full meal is not required. 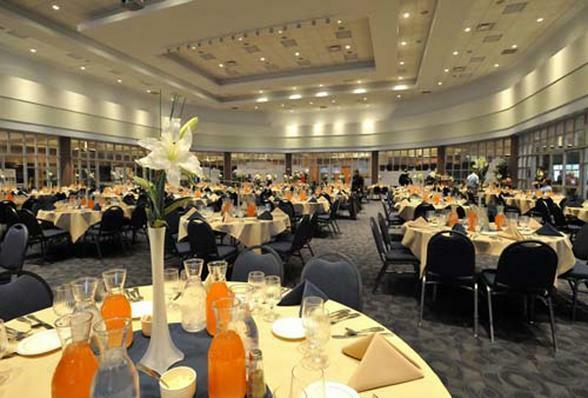 Your evening banquet can be elegant, or less formal with an international buffet. Both prepared on site, hot and appitizing, served with "white glove" service. Alcohol or Beverage service stations attended by professional bartenders, can be set up as requested. Both hosted or cash bar are available. The Glass enclosed Garden Room located in our North Lobby is perfect for weddings, mid sized banquets or special occasions. Flexible dining space from 100-950 seating at rounds. Whether elegantly served meals or themed buffets our caterer can provide many options tailored to fit all your event needs. The Exhibit Hall can accommodate up to 3,000 seating for extremely large functions while still maintaining the "white glove" service with the menu option of choice. 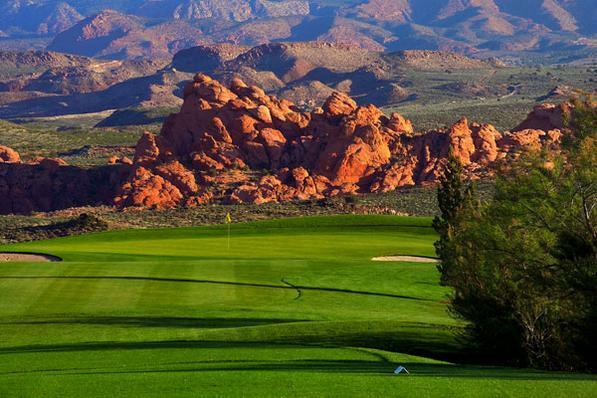 Year Round Golf	 St. George offers more golf than any other place in Utah. 12 challenging courses with inspiring terrain, warm year round temperatures, affordable greens fees and some of the finest course designs in the Sunbelt. Play amid breathtaking red rock beauty with black lava rock, cascading water falls and stunning crimson sunsets. Zion National Park	 Zion National Park is a geological wonder of towering sandstone cliffs, forested canyons, waterfalls and hanging gardens. 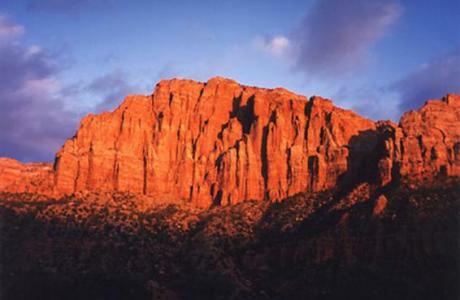 Celebrating 100 years since becoming Utah's first national park, Zion has become known for the amazing diversity found within it's boundaries. Tuacahn Amphitheatre	 Set amid a stunning red rock backdrop deep in Snow Canyon, is a 90 foot stage with a 2,000 seat amphitheatre. 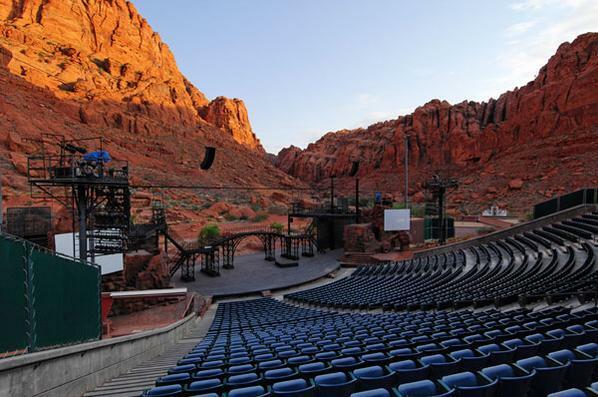 Tuacahn is the home of Broadway in the Desert, featuring Broadway musicals with elaborate sets and costumes, seasonal concerts and other special events. 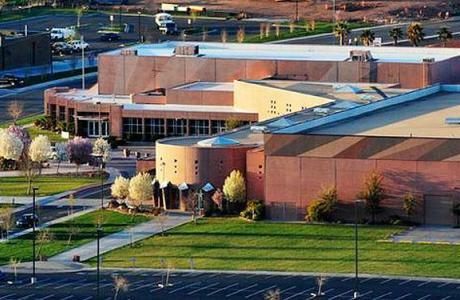 If you haven't seen it at Tuacahn, You just haven't seen it! Spas	 This stunningly scenic area is an inspirational setting for rejuvenating the body and spirit. There are several day spas and 2 world class destination spas providing an array of health and wellness programs for ultimate relaxation and pampering. Snow Canyon State Park	 Located nine miles north of St. George, Snow Canyon is notorious for its unique geologic features including volcanic cones, sand dunes, deep red sandstone cliffs and twisted layers of rock. The scenery makes it a perfect destination for hiking, picnicking, biking or a horseback ride. 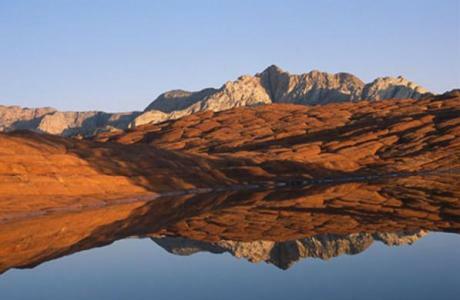 Adventure	 The mild winter climate, amazing scenery and stunning geography provide an ideal combination for year-round thrills. Climb the sandstone cliffs, bike the red rock trails, blaze an ATV trail through brilliant orange sand dunes or explore the backcountry on horseback. There are plenty of outfitters to show you the way, or you can go it alone and create your own adventure. Shopping	 Enjoy the abundant shopping options in the St. George Area. Visit Red Cliffs Mall for a variety of name-brand stores. 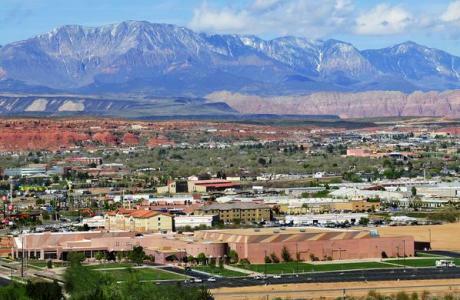 Zion Factory Stores offers great factory outlet shopping amid desert beauty. The Promenade at Red Cliffs has national name brand stores. Ancestor Square is just the spot for boutique shopping, eateries and galleries. 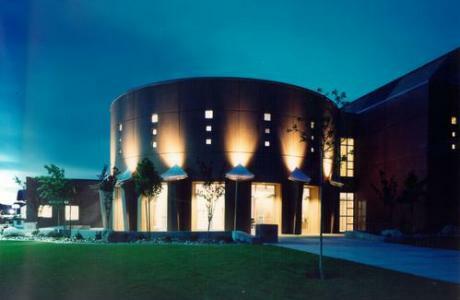 Museums & Galleries	 Southwestern Utah is one of the great destinations for art. 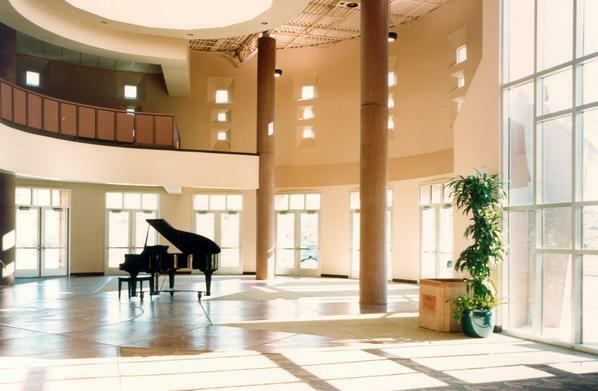 In recent years many excellent museums and galleries have been opened in the St. George Area featuring everything from dinosaur tracks to priceless works of art. Visit the area art galleries and museums to view the works of many local artists as well as those of artists from around the world. 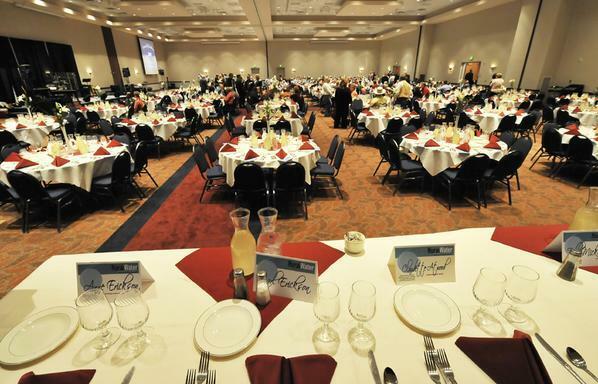 Sports & Events	 Utah is the State of Sport and the St. George area is in the starting line up. 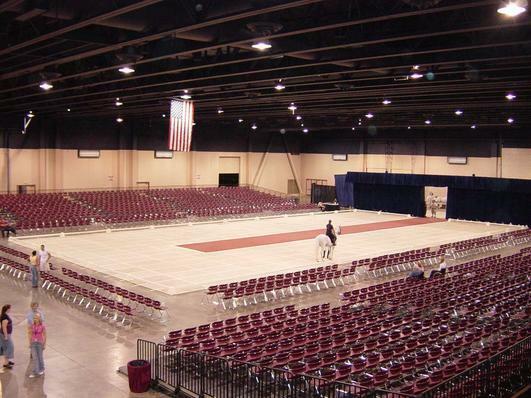 St. George has a long tradition of success when it comes to hosting sporting events. The St. George Marathon is the 15th largest marathon in the country, and ranked by Runner's World magazine as one of the 10 Most Scenic races. The Canyons Softball complex has been voted the National Softball Associations Softball Complex of the Year six years in a row. Each year, St. George hosts the Huntsman World Senior games featuring 10,000 participates from around the globe competing in 25 different sports. This is a broad and diverse sports community where its all about clear skies, beautiful scenery and warm sunshine all year long. History	 St. George is loaded with rich cultural and geographic history. Experience a self guided walking tour through the historic district, where many historic public building and private homes stand as reminders of a bygone era.